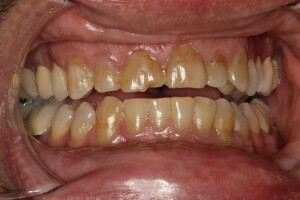 Mrs. M had years of damage on her teeth ranging from bruxism to acid wear. It was very important in this case to identify the type of damage she was doing to her teeth to put her in a solution that would last for many years to come. We were able to give her a very natural and esthetic outcome that is also designed to withstand the type of stress that she places on her teeth. We additionally gave her the ability to eat and drink normally without being in extreme pain, without doing a single root canal. Mr. D damaged his front teeth for many years of his life. The damage was spiraling and happening at a faster rate when he decided to fix the damage while achieving a natural outcome. His desire was to treat as few teeth as possible to achieve a natural look. Mr. D and the staff at Vienna Cosmetic and Family Dentistry were all very excited about the result. A very aesthetic outcome while appearing very natural. Mr. V. was unhappy with the look of his front teeth. He had lost enamel from teeth grinding which resulted in shortening the length of his teeth, as well as created cracks that threatened to fracture his teeth. His teeth were also very discolored from the medicine he took when he was younger. 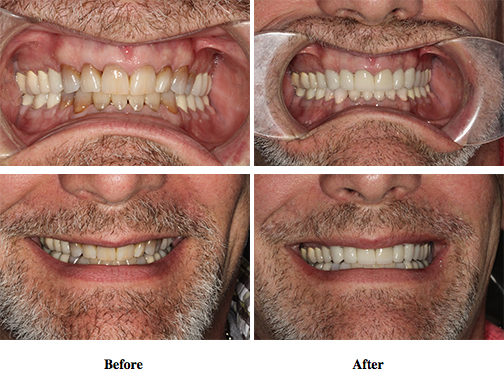 He wanted to have a natural looking smile, as well as restore his teeth to their original length. The results were amazing, giving him a very natural and esthetic outcome. The new length of his teeth allowed his front teeth to be seen in normal conversation and at rest. This also gave a much more youthful result as well. Ms. P. has been missing her back teeth for many years and her front teeth were not savable. 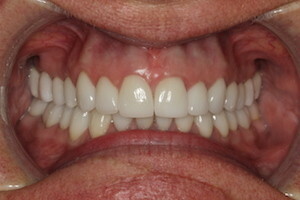 She wanted a great smile and fully functional teeth, but did not want to remove her existing teeth or have dentures. We were able to satisfy and exceed all of her requirements with the use of implants and dental restorations to fix all issues on her upper teeth. She now has a beautiful smile and her teeth function just like her natural teeth did before she lost them! After sustaining a football injury that changed the color of Mr. J.C.’s tooth, he had a front white filling placed by another dentist that he was not pleased with. The color match was off and the shape was bulky. 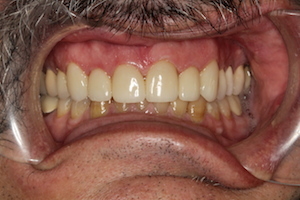 After identifying the correct color, we were able to remove his previous filling and place a closer cosmetic match. Y.Z. was born with misshapen lateral incisors. With very minimal (almost none) tooth cutting, we were able to place veneers that fit seamlessly and matched her natural teeth, allowing her to smile with confidence. The dramatic change took just a few days to produce years of enjoyment. Mr. T.H. was genetically missing a few front teeth. He had previously had Maryland bridges done that no longer met his aesthetic demands. By removing the old bridges we were able to create beautiful and more modern Maryland bridges. Mr. T.H. 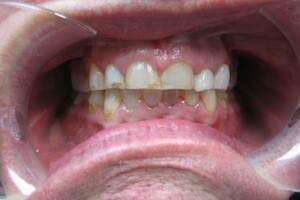 did not want implants or any cutting of the front of his natural teeth. 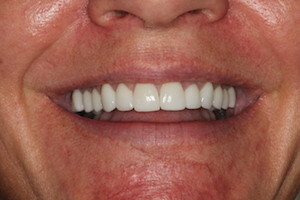 We were able to meet all his requirements and provide a much more natural smile. Mr. P. had an anterior open bite (couldn’t close his front teeth together) as well as misaligned and crowded teeth. After years of having trouble biting into sandwiches and various foods, he wanted to make a change. Through less than 6 months of active Invisalign treatment (clear braces), the teeth were aligned and allowed for much better function and chewing.